As per our last blog, we started talking about business objectives that can be fulfilled by Facebook Marketing and a few case studies. If you have not read it yet, here is the link to help you understand more. This week we will talk about the remaining business objectives and case studies that Facebook can help the market. Local Sales objective is apt for businesses having an offline store set up like: Restaurants, Spas, Salons, Coffee Shops etc. Most of the Small and Medium businesses miss out on the opportunity of taking their business online due to the general misunderstanding that since they have an offline store, social media platforms or digital marketing will not be able to drive sales to their stores. But this is not right, if you are a local business you should use all the marketing methods out there to increase your sales and digital marketing is the best-known option. If you want to learn more about why digital marketing is right for small and medium businesses we have listed out 5 reasons. So, llet’sget to the Why Increase Local Sales and How Facebook can Increase Local Sales. ⦁ First reason to increase local sales is to definitely get that potential customer into your door and make them a paying customer. Who would not want more people visiting their stores??? ⦁ Target users when they are near your store or on their mobile searching for a product/service like yours. How can Facebook Increase Local Sales? Facebook helps you target the right audiences who are interested in your business using targeting methods like: Demographic, Age, Interests and also when their location is near your store. You can also guide the audiences to your store by promoting “Get Directions” so they can reach your store easily. Also a restaurant or coffee shop could run targeted ads during a specific time of day for special offers like Lunch Buffets, Free coffee for 1+1 etc. during lunch hours or when their business is slow during afternoons to get more people into their stores. Let’s look at a business “Rajeev’s Coffee Shop” and understand how we could leverage Facebook to market this brand. Rajeev’s Coffee Shop, owned by Rajeev is his dream and he has personally picked each and every decor item crafted the menu and loves when people come into his coffee shop and have a good time. His only problem is his location though has the highest number of colleges which house college students who love coffee and would enjoy his place, he does not know how to reach them? He has tried advertisements in newspapers and pamphlets have been distributed in the surrounding areas as paper inserts but still there has not been the great turn out. Only the occasional customer who might have accidentally found his coffee shop steps in but there is no way that Rajeev can engage with him once he leaves the shop. 1. He could target his potential audiences according to their age, location, interests and run ads during a specific time of day or for the whole day. 2. He can target not only people residing in the location that his store in but also people who are visiting the location of his store or who are travelling in the location of his store. 3. He can advertise “Get Directions” for his store so potential customers can easily reach his store without confusion. 4. He can specifically target with local ads people who are attending any specific events in the location that his store is in. 5. Once they come to his store he can use a digital marketing strategy to divert them to his Facebook page and make them his social subscribers that ensures that he can stay connected with them and more importantly also reach their friends. 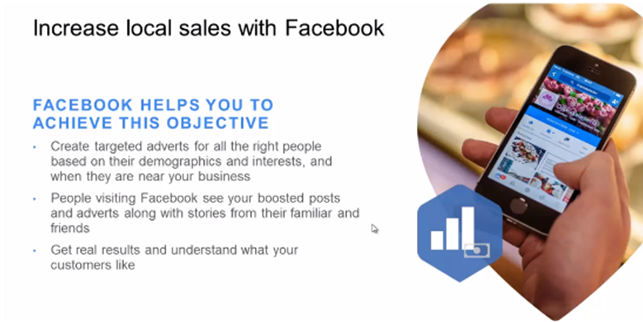 The 4th objective that can be optimised using Facebook Marketing is “Driving Online Sales”. This objective is very specific for an e-commerce store or a website which sells its products online. Lets get on with the Why Drive Online Sales and How Facebook Marketing can Drive Online Sales? ⦁ Simply because more sales = more revenue for the business. ⦁ Not only that driving sales online allows you to measure exactly what kind of marketing strategy is effective. It allows you to test different market strategies and then fine tune them accordingly. ⦁ Provides you with a lot of opportunity to engage with your audiences and make them your paying customers. 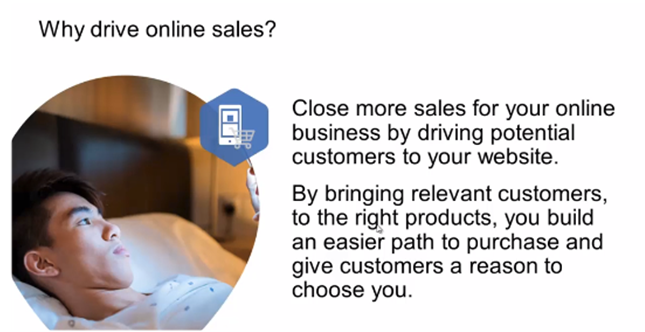 ⦁ Driving online sales also helps you retarget the right product to the right customers. How Facebook Marketing can Drive Online Sales? ⦁ Online Sales mean – you can sell your product anywhere across the world and increase your customers as many fold as you can manage. ⦁ Facebook Marketing allows you to engage with potential customers when they are actively browsing on Facebook. This means no more passive ads. ⦁ You can target potential customers using parameters like: Demographics, Age, Interests, Stage of Life they are in (Single, Married, Parents etc.) , Job titles etc. so you can screen and only reach the right target audiences that are fit for your brand. ⦁ Using Facebook Marketing you can pull these audiences onto your website by promoting your website and luring them with coupons. Once they are on your website you can note their behaviours and understand which specific product they might be interested in on your website and then retarget the product to them. ⦁ Facebook marketing provides you with the ability to test your ads, ad copy and images and only work with the best performing ads so you don’t waste your precious money on non converting ads. 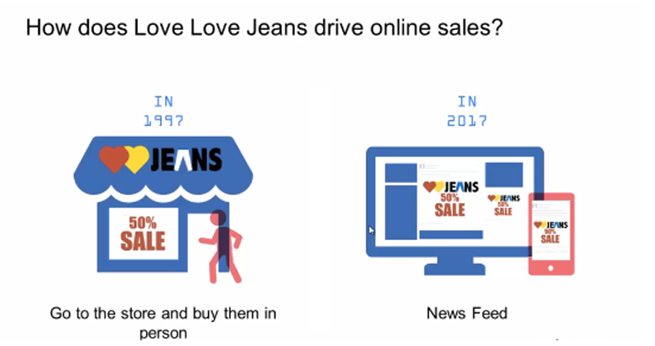 Lets look at a business “Love Love Jeans” and understand how we could leverage Facebook to market this brand. Love Love Jeans is a jeans retail shop which brings fashion fads to the city according to the latest fashion trends worn by Bollywood actors/actresses. They have an offline store but also sell jeans online using their website which supports placing orders and paying online without the need to visit their offline stores. It also implies that Love Love Jeans can now sell their jeans not just in their location but also across India. The last business objective in this series of Facebook Marketing is “Promoting Mobile App”. This objective is for businesses who have their own mobile apps, these businesses might be: Gaming, Restaurants, Pubs, Cafes, Cab booking services, Map services, Location specific discounting businesses like : NearBuy etc. 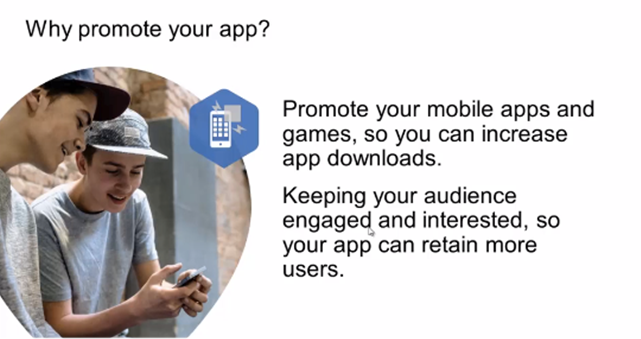 Lets look at Why Promote your App and How Facebook Marketing can Promote Your App? ⦁ Getting an app made is not easy, its intensive both capital wise as well as time wise as you have to sit down with the mobile app development company to design the app and it takes anywhere from 3 months – 1 year with an investment of 30K – 10 Lakhs depending on the features of the app. When you have invested so much on the app does it not make sense to invest in promoting it as well so you can get to as many customers as possible? ⦁ To Create and Increase Brand Awareness – App unlike a website only works when somebody potentially downloads and installs it onto their mobiles. That also means that they need to potentially know about your brand and your app, so you first need to create brand awareness for your app and then increase it to reach to more potential customers. ⦁ To Increase App downloads and Installs. Even if the app is popular it only makes sense when your potential customers actually take action and download and install the app onto their mobile phones, that inherently means you need to create that push. ⦁ To Create and Increase App Engagement – 70% of the customers who actually download an app, use it only once or don’t use it at all. So continuous engagement needs to be created to make them keep coming back to the app and use it to buy your products/services. How Facebook Marketing can Promote Your App? ⦁ Reach the right target audience using parameters like: Demographics, Age, Interests etc. ⦁ Engage with audiences who have taken the necessary action like: Making a purchase, Referring a friend etc. ⦁ Effectively track your Facebook investment against the number of downloads or sales dependent on your ad objective. We hope you enjoyed this week’s School of Marketing dose for Facebook Marketing. We will continue discussing about face book marketing in the coming weeks so stay tuned for next week.